James Trevor Oliver, is mainly known for his typically English cuisine that has garnered him numerous television shows and restaurants He is a British celebrity chef and restaurateur. Here we are going to describe how to make Jamie Oliver homemade burgers. 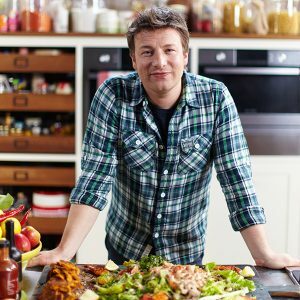 In June 2003, Jamie Oliver was awarded the MBE in the Queen’s Birthday Honors. Oliver was named as most influential person in the UK hospitality industry as he topped the inaugural Caterersearch.com 100 in May 2005.In 2006 he was on the second list as another celebrity chef Gordan Ramsay came ahead of him that is at the top. But In July 2010 he was again able to gain the top spot and once again he was known as the most powerful and influential person in the UK hospitality industry. According to him you can make the burgers or sliders in an oven at full whack, on the barbecue or in a hot pan. Pre-heating is necessary If you’re using the oven or barbecue. And then put a teaspoon of olive oil into a large frying pan on a medium heat and add pieces of chopped onions. Fry for 10 minutes or until the onions have become soft and brown, after cooking put to one side to cool completely. To get a fine consistency blitz your crackers or bread in a food processor. Oil a clean baking tray and put aside. Put the cooled onions into a large bowl along with the rest of all the burger ingredients. Use clean hands to scrunch the mixture together really well, then divide into equal parts. Lightly wet your hands and roll the balls into burger-shaped patties about 3-4cm thick .place your burgers on the oiled baking tray and pat with a little olive oil. Cover them with cling film and put the tray into the fridge for at least an hour, or until the patties firm up. In this time you can make your spicy mayo, so put all the ingredients into a bowl, mix well and put to one side .If you are using a frying pan or griddle pan, put it on a high heat now and let it get really hot. However you decide to cook your burgers, cook them around 3 or 4 minutes per side .you may have to cook them in batches if your pan isn’t big enough. When your burgers are nearly cooked on one side, add the rashers of bacon . then flip the burgers ,whichever way you’re cooking and cook the bacon until golden brown and crisp. When the burgers are cooked to your taste and it’s all looking really good, halve your burger buns and warm them through. Put the bacon on a plate lined with kitchen paper to drain. When everything comes together put your patties into their buns add all the toppings that you would love to add also put spicy mayo then tuck in with a lovely fresh salad, baked potato or potato wedges. It is better if you serve them with french fries, onion rings, chips, or other sides, along with a soft drink, juices or beverages. You can make some kind of art or design burger in the theme to serve people using beautiful plates. In case that your burger buns are getting soggy, try toasting them ahead of time. Before forming the patties mix the meat with eggs and bread crumbs in a mixing bowl. This will give them a richer taste and help keep them from falling apart.It mainly helps in binding the patties. Try mixing the meat with dried onion soup mix instead for a stronger and tasty flavor. Enjoy your own home made burgers! Do not forget to wash your hands after touching the raw meat every time. Make sure that your toppings like lettuce tomatoes and ketchup are healthy enough to serve,you need to wash them properly with clean water. As under cooked food does increase the risk of food poisoning make sure your burger is well-cooked. Though you may prefer your meat rare or medium-rare,. Cooked meat needs to reach a certain temperature for a specified period of time in order to kill any bacteria that may be inside. Beef is cooked at 77°C (170°F). You may find that reaching these internal temps leads to a dry product, so some people only cook it to an internal temperature of about 150°F. If you’re using lean meat, there isn’t enough fat to cook it without burning so we need to use fat or oil. But in case of meat containing fat you need not to put fat or oil. You can make mayo sauce adding spices or you can buy any branded sauce too for the better flavor and taste. Next story How to make Simple Burger Recipe?